Het Hit of the week - Durium project is in 1994 gestart met de publicatie van de eerste Hit of the week - Durium discography, een boekwerkje van 40 pagina's waarin een tweehonderdvijftigtal Durium platen, m.n. de Hit of the week platen beschreven stonden. Op dit moment zijn er een drietal boeken verschenen met in totaal een 1300-tal Amerikaanse en Europese Durium platen. Door dit Hit of the week - Durium project zijn er zo'n duizend uitgaven boven water gekomen, die nooit beschreven en dus (bijna) vergeten waren. De papieren discografieeën zijn nog steeds te koop, maar er wordt ook hard gewerkt aan een online Hit of the week - Durium discografie. Het verschijnen van de discografieën maakte het mogelijk om de kartonnen platen opnieuw op CD uit te brengen. Er zijn momenteel wereldwijd een tiental CDs verschenen die compilaties bevatten van deze kartonnen platen; zes Amerikaanse producties, drie Japanse en één Nederlandse. De kwaliteit van de opnamen verschilt enorm, mede omdat het maken van een goede transfer heel moeilijk is. Zelf heb ik de discografische informatie voor de drie Japanse en de Nederlandse CD mogen leveren. Dankzij het gedurfde initiatief van Archeophone is het aantal Hit of the Week CDs binnekort uitgebreid tot achttien. In 2002 kwam Doug Benson met het gewaagde voorstel om te proberen alle wekelijks verschenen Hit of the week platen op CD uit te brengen. Een droom voorstel, waarop ik natuurlijk geen nee gezegd heb, al was bekend dat sommige uitgaven helemaal van de aardbodem verdwenen leken. Toch lukte het ons om binnen een jaar alle Hit of the week platen, ook die, waarvan alleen maar een enkel exemplaar aanwezig was, boven water te krijgen. Om de enige Nederlandse promotieplaat (die niet op Archeophone verschijnt) te beluisteren klik je hier. - De eerste Amerikaanse promotieplaat van eind 1929 hoor je als je hier klikt. De eerste twee dubbel CDs met de Complete Hit of the week Recordings zijn verschenen op het Archeophone label en de volgende twee verschijnen eind 2006 en eind 2007. De CDs zijn te koop bij Muziekhandel Spronk te Breda en bij Timeless Records in Wageningen. There are some Hit of the week recordings that have mysterious signs ( the X and the A ) stamped into the surface of the label. The L1 has an A across the catalogue number and an X across the composers credits. The M-4-5 has an X stamped through the catalogue number. There are six Hit of the week who have these marks. Has one of you such a Hit of the week or Durium record that hase these or similar signs? What is the purpose or the meaning of these signs? Thanks Alex for pointing me to these strange signs. Thanks for your reply. It seems that most US visitors of the website still can open the Hit of the week - Durium Discographies . I don't have a good view according our friends in Asia and I hope they will reply today. It seems that most South American still can't open the sites. I hope the problem will be solved soon. 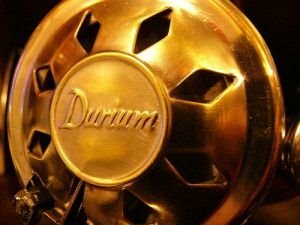 Due to a problem with my provider I learned that my http://keepswinging.opweb.nl and http://durium.opweb.nl sites are no longer available in large parts of the world. Only readers from the West European countries seem to have access to it. Of course I'm very angry about this partial decision of the provider and I'll keep in touch with you about that. I'm sure this is a temporary situation. This means that if you can't open my web sites now, you are the victim of a narrow thinking provider. We'll keep in touch. This web blog has no relations with the Opweb provider and will be accesible for everyone. The fourth podcast made by Bryan Wright contains two records, both sides, but he is right as he says that this is impossible for the first record, the Phil Spitalny HIT OF THE WEEK F-3-4 release of June 1932. Never mind, because this HIT OF THE WEEK F-3-4 is one of the so-called 5 minutes records which were labeled as TWO BIG "HITS". This series lasted for eight releases only and then the weekly HIT OF THE WEEK series stopped. 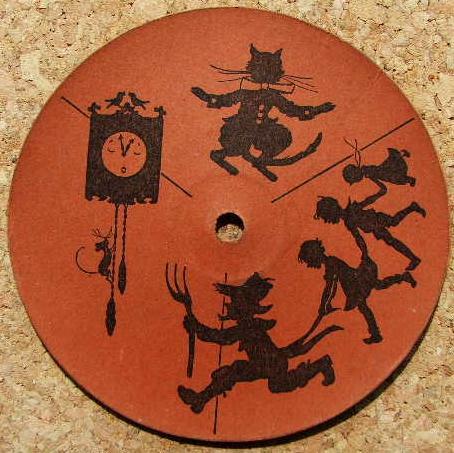 They have two complete tunes, as opposed to the first 5-minutes records, who contained one-an-a-half tune; one normal tune and a copyright-free free extra to fill up the remaining 1.30 minutes ( mind that tunes were composed normally for the duration of 3.5 minutes, the playing time of the average record.). These last eight records, this Spitalny's was the one-but-last, were sold for 20 cents ( not 15 cents Bryan ! ). I like the second tune of this record the most as its subject is one of my most favorite girls of the 1930s. I'm sure that the arrangement of the tune as played by Phil Spitalny was used as intro for one of the films, although I'm not yet sure which one. I'm getting mad of one of the favorite instrumentalists that plays on more then one Hit of the week: Charlie Magnante, the accordion player. Oh boy, what a drive, what a swing. Well I'd say enjoy Bryan's podcast number 4. He plays the Hit of the week and a non-cardboard record, a Hawaiian tune I haven't mentioned here. Here's the podcast: Scroll down to Shellack Stack Podcast number 4. Click on it and if you have a mediaplayer the podcast will open. You can also click it with your right mouse button and save the podcast on your hard disc. Mind that it can take some times before the music is downloaded. Where did you found your ... Hit - 1 ? Most Hit of the week and other Durium records have a history. They appear sometimes unexpected in our lives. It must be about 10 years since I last acquired any 78s. On Sunday I took a load of garden rubbish down to the local council 'tip' where I spotted a 20"x30" sheet of plywood with ten '78s' affixed with small bolts through their centre holes. I don't know how long they'd been standing in the open but all are well weathered. out. Also in the shellac is the number 5770-t. ......... Other items in this find include two Little Marvels, a 6" and a 5.25", a 5" Eclipse aluminium Personal Record, a 9.5" Durium (EN-44), a 4" Durium Junior (5044) a 6" Mimosa, a 9" Crown and a 7" Victory. Congratulations finding this great treasure, John !! durium EN-44:Although this record is labeled as the DURIUM DANCE BAND it is in fact a vocal record. That’s the reason this record has not been included in Brian Rust British Dance Band Discography. The vocalist is Fred Douglas. This record was the last known record from the durium EN-series. It might be published around March 1933, although other sources say it was recorded around March 1933. (E) Have you enjoyed this? Well, why not hear some more? You can obtain a set of three of these records in a picture-book from your newsagent or bookstall. There are six or more different nurseryrhymes in each book. Price only sixpence. Also don’t forget forget to order your Durium self-changing dance-record each week from the same place, price one shilling. It plays on any gramophone with any needle. A round 4" promo for the NURSERY RHYME BOOKS (E-5018 till E-5023). 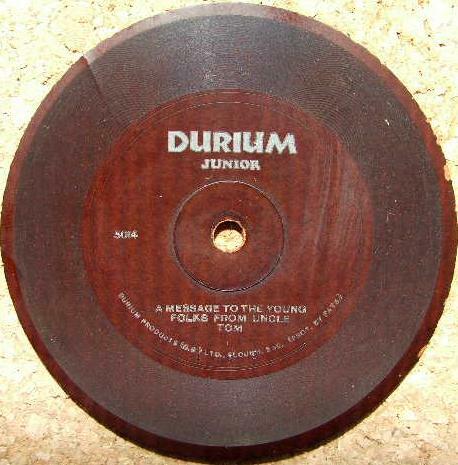 Mind that the name DURIUM JUNIOR is printed in capitals, but different then the American DURIUM JUNIOR // On the record nursery rhymes (according to the drawings on the reverse) Sing a Song Of Sixpence / Mary Had a Little Lamb followed by a sales talk for the DURIUM FOR THE YOUNG FOLK Nursery Rhymes Set. There are records with a blank reverse and records with some pictures as on the next series. Also the labels of the two versions seem slightly different. Mind that the name UNCLE TOM was used for Frank Luther on the DURIUM MOTHER GOOSE series and that the serie this record refers to is sung by Harry Hemsley. The titles sung on the record are the same as the DURIUM MOTHER GOOSE Part 5 record (5076-B) sung by Uncle Tom. All Hit of the week - Durium records are listed in my discographies. The online Hit of the week-Durium discographies are still under construction, but large parts have been finished.